Bangladesh more than held their own on the second day at Lord's, reaching 172 for 2 at the close - 134 runs away from the follow-on - after Shahadat Hossain's 5 for 98 saw England bowled out for 505 after Jonathan Trott hit 226. Imrul Kayes and Tamim Iqbal added 88 for the first wicket before Junaid Siddique guided the visitors to the close with a determined, unbeaten 53 alongside Jahurul Islam. England had been expected to dominate the day when they started on 362 for 4 but it didn't quite transpire that way even though Trott reached a career-best first-class score and equalled Kevin Pietersen's 226 as England's highest Test score since Graham Gooch's 333 in 1990. Shahadat's effort kept Bangladesh in the game and also made him the first Bangladesh cricketer to be included on the honours board at Lord's. Tamim then shrugged off concerns about his injured left wrist with a half-century compiled in his own inimitable fashion after the visitors came out to bat midway through the second session. He got going by slashing Tim Bresnan over the slips and hammering a pull through square leg from consecutive deliveries, but also flashed wildly every so often to keep the bowlers interested. Kayes was found out by the short ball during England's tour of Bangladesh, and it wasn't long before Bresnan and James Anderson were testing his technique. But as the shine started to come off the ball, things became easier and Bresnan was removed from the attack after Tamim took to him with three marvellous strikes in one over. Tamim brought up his fourth half-century in five Test innings against England with a powerful pull through midwicket. He celebrated with a superb pick-up over square leg off the front foot, but two balls later took on Kevin Pietersen's arm with a risky single and was run out for 55 by a direct hit from point. With his wicket, Bangladesh suddenly seemed more vulnerable, having collapsed after similarly promising starts countless times before, but this time they showed they have the grit and determination as Kayes and Siddique built another solid partnership. However, Steven Finn's pace and bounce eventually proved too much for Kayes to handle, as he gloved a nasty, neck-high bouncer to be easily caught by Andrew Strauss at first slip for 43. Again, England felt they had their opening, but Siddique and Jahurul buckled down and defied everything the hosts could throw at them. Siddique had started aggressively, striking four boundaries before he had reached 30, but reined himself in after Kayes's departure while Jahurul, determined to survive until the close, was in no hurry at all. Siddique passed fifty with a firm push to the midwicket boundary off Swann and as the end of the day approached both batsmen retreated into a defensive shell. They had some luck too, as the odd ball nipped past the outside edge and an inside edge from a tentative prod by Islam shot just past the stumps in the final over, but Bangladesh will be mighty pleased with their efforts. They had desperately needed a good start after a weak showing on the opening day, and Shahadat responded with a determined opening spell as he found movement through the air with a newish ball and kept tight off-stump line to trouble the batsmen. He was quickly rewarded with Eoin Morgan's wicket - edging a flat-footed push to be well caught by a tumbling Mushfiqur Rahim behind the stumps - and also hurried both Trott and Matt Prior's defences with his probing line. Bangladesh were gifted their second breakthrough by some witless running as Trott placed the ball through the covers and Prior charged back for a second run, only to see his partner wasn't responding. Unperturbed, Trott progressed in much the same vein as he had on Thursday. 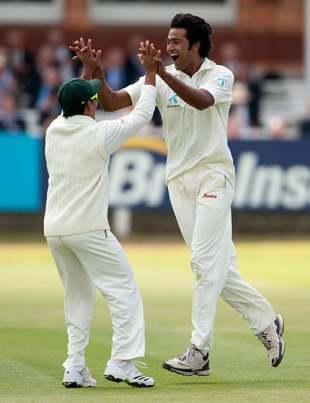 However, Shahadat continued to impress after lunch to break a 63-run partnership between Trott and Bresnan, changing his line of attack to round the wicket and forcing Bresnan to push away from his body at a delivery angled across him to edge a catch to Siddique at a wide first slip. Graeme Swann wasted no time in getting going, but Bangladesh struck again when Trott opened the face of the bat to guide a ball straight to backward point to end his 349-ball stay before Shahadat secured his pride of place on the away dressing room wall by rattling Anderson's stumps. Bangladesh left the field with a spring their step and ended the day in equally high spirits.